I was dying. Not metaphorically, not of embarrassment, I was literally ebbing away. After a lifetime of fighting progressive kidney disease, I could sense the end. I’d been on dialysis for 3 years, waiting and hoping for a transplant. I’d also been using every bit of willpower and determination to keep a full-time job at a demanding tech company. Good health insurance wasn’t optional. I didn’t want to bankrupt my family with my treatments. This was it. The wait for a transplant stretched on-and-on. I was out of energy. My plan was to tell my boss at the end of the that I needed to go on medical leave. I already knew I would never return and the leave would be permanent. The grueling routine of working a full day and then hitting dialysis for another six hours three times a week was too much. That’s when it happened. The transplant center called me at work just a few hours before my big meeting with the boss. They had a kidney for me. It was an “unusual situation” they said. The kidney was from an anonymous living donor. I was a good match and lucky enough to be the next person on the list. Anonymous. Living. Donor. A person who wanted to give back to society and knew they could change someone’s life. It didn’t make any sense to me at all. I was sure it was all a joke. The following Monday when I woke up in the ICU with a new kidney and a second chance at life, I knew it was real. Let me contextualize this. In Oregon, USA where I live, there had been 234-million-dollar state lottery winners. I was only the 9th person in Oregon to receive a kidney transplant this way. I know what it is like to win the lottery. If you’re interested in that journey from beginning to end, you can read the blog I wrote that details the experience, here. You can also meet the amazing (now not so anonymous) donor who changed my life. So, what does all this have to do with cycling and cycling training? For me, finding cycling has been like winning a second lottery. The sense of freedom and harmony with nature is unbeatable. Challenging and then surprising myself when reaching new levels of skill and fitness, is the best thing ever. If I can do it, so can you. 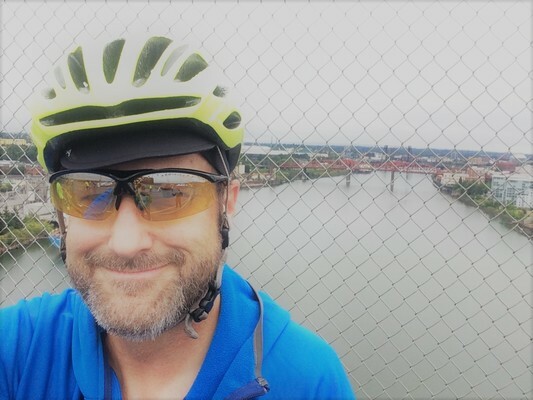 In this blog, I will detail what’s its like to start cycling as a 6’6” 285-pound 48 year old newbie. I’ll walk you through every step of getting started and show you how you can do it too. I’ll answer the question “why cycling” and not some other random sport. I’ll show you how even a Clydesdale like me (what cyclists call big riders) can climb hills and crush the flats. I’ll show you how you can succeed and improve with every single ride.